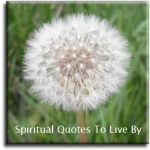 These poems and quotes about babies are all positive, inspirational words of wisdom and love from known sources. The words from unknown sources are on a separate page of Sayings about Babies. I have always thought babies are an absolute joy and each one is a perfect, unique miracle. 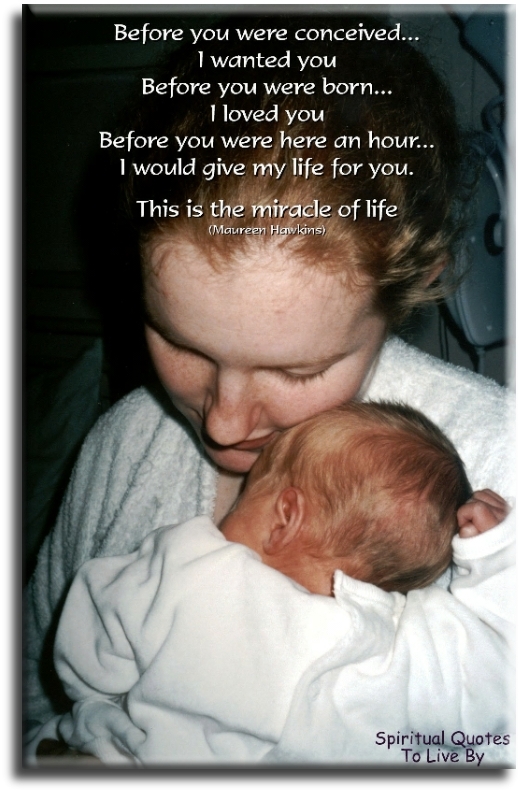 The most precious moment of my life was when my first baby was placed in my arms after the birth. The immense feeling of love that I felt was indescribable, even now, thirty plus years later, I still treasure that moment, I just think about the weight of that little bundle of love in my arms and I am uplifted. I also felt the same with my other children, but I think the first sticks in your mind more, because it's a new experience. 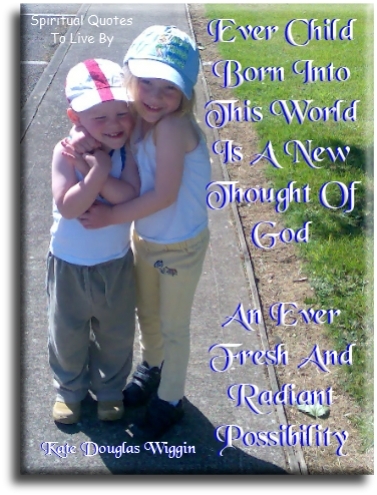 I now have ten grandchildren to adore, each one is yet another miracle and, along with their parents, are the greatest treasures of my life. 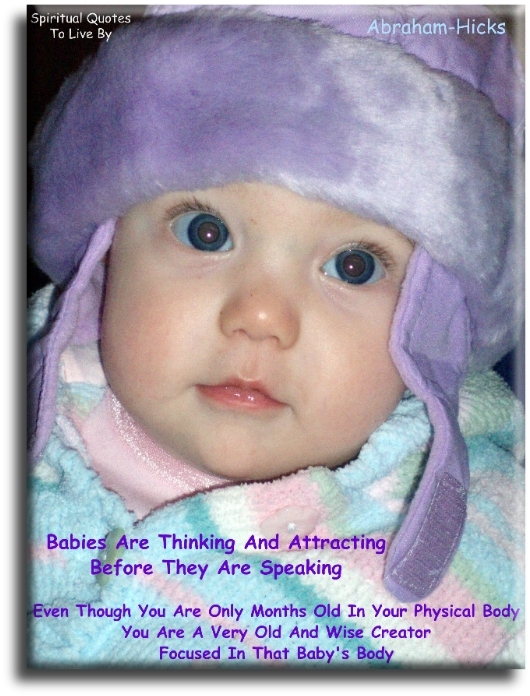 Babies are thinking and attracting before they are speaking. 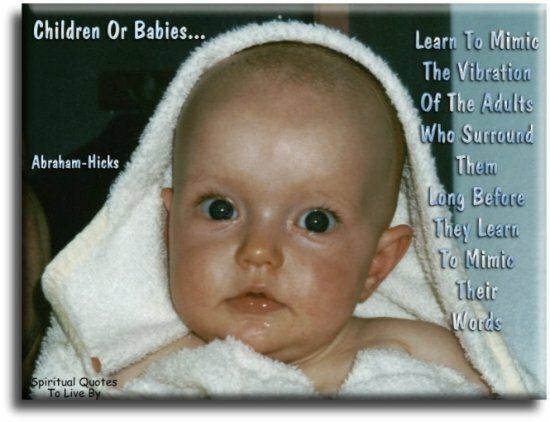 Even though you are only months old in your physical body, you are a very old and wise Creator, focused in that baby's body. When the first baby laughed for the first time, the laugh broke into a thousand pieces and they all went skipping about, and that was the beginning of fairies. And now when every new baby is born it's first laugh becomes a fairy. Most of us would do more for our babies than we have ever been willing to do for anyone, even ourselves. 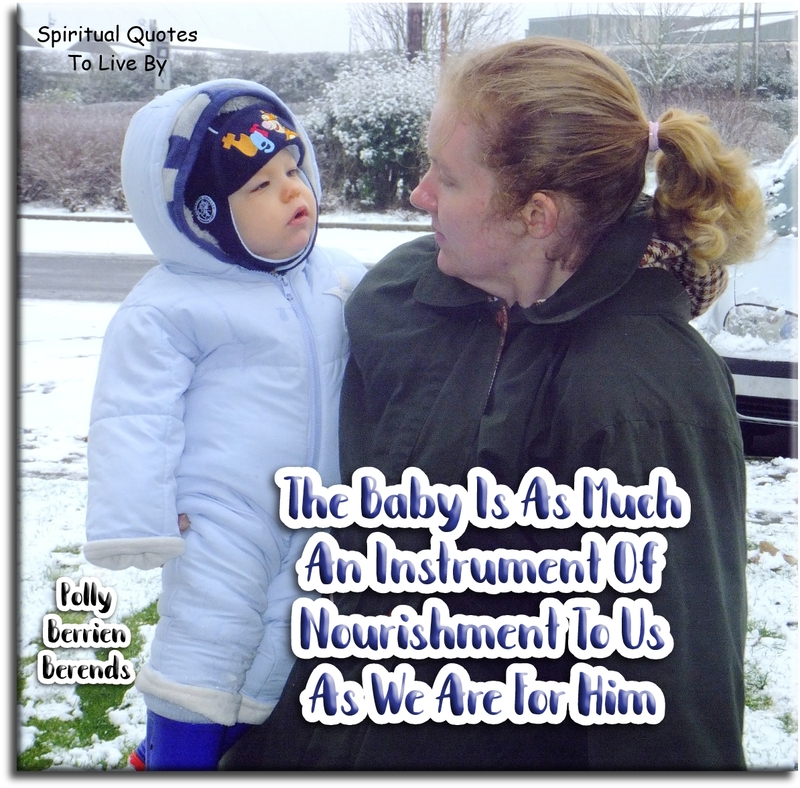 The baby is as much an instrument of nourishment to us, as we are for him. I am so ready to be a mommy. I can't wait. I notice every little baby dress, every little baby toy, every little baby thing. If your baby is beautiful and perfect, never cries or fusses, sleeps on schedule and burps on demand, an Angel all the time... you're the Grandma. Grandad has a long and earnest conversation with his grandchild. He says, you are noisy and wiggly and will be sent back if you don't pull herself together.. The baby smiles complacently. She has him exactly where she wants him. All babies are pure love. Although a newborn baby is pure love, it is unable to radiate this love out; it hasn't learnt this yet, just as it hasn't learnt to walk. The love is inside it, but it doesn't know how to give it out. When a mother (or someone else) reaches for the baby with love, the force of love from the mother draws the baby's love out. As newborn babies, we know we are perfect and deserving of love and feel pure love for ourselves and everyone around us. 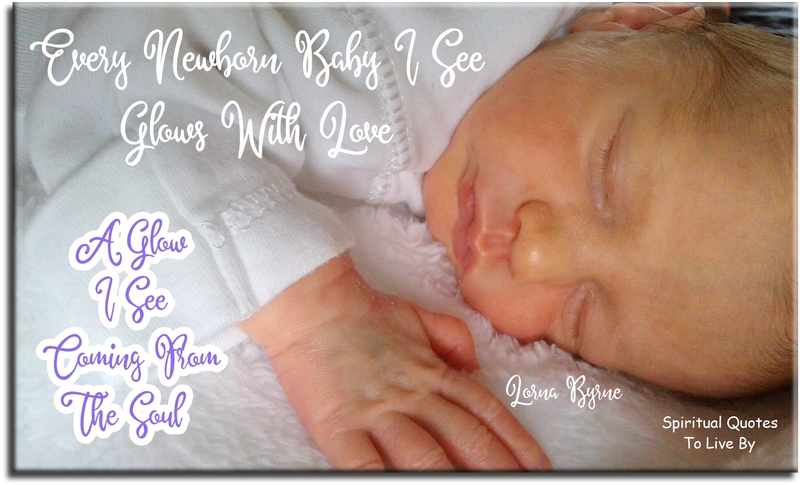 Every newborn baby I see glows with love, a glow I see coming from the Soul. We are all born pure love. As a baby in our mothers womb, we all love unconditionally. Everyone of us, regardless of whether we are wanted, or whether our mums have an easy pregnancy or labour, glow with pure love when we are born. The wisdom of a sage! You were created to be completely loved and completely lovable, for your whole life. 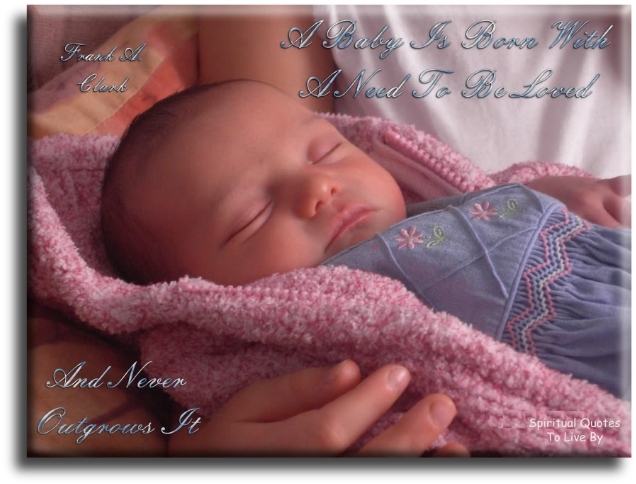 A baby is born with a need to be loved... and never outgrows it. Some people have got advice, some people have got horror stories. I like people that look you in the eye with a glow and say "It's gonna be cool." 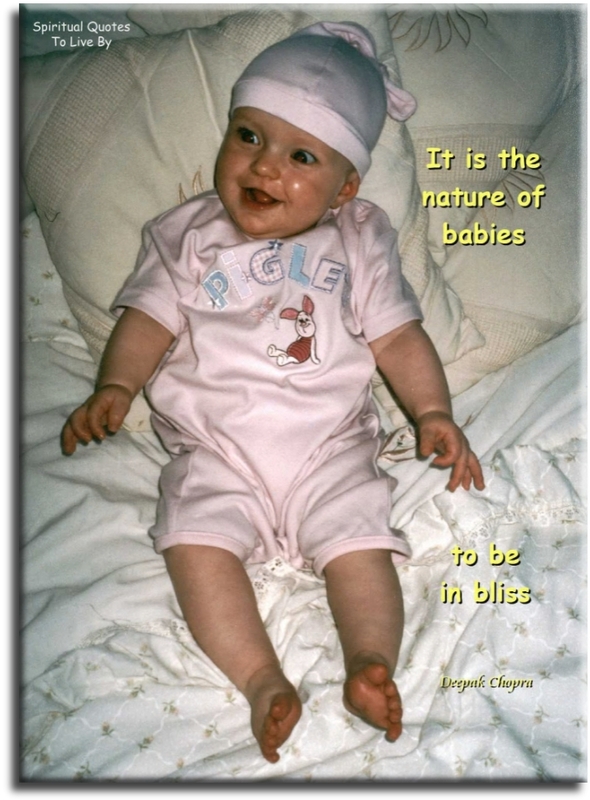 Birth is our source experience in the body, and we were conscious at birth, educable in utero. Birth affects our whole subsequent mental, emotional and spiritual well-being. Golden slumbers kiss your eyes. Smiles awake you when you rise. It's all kind of these profound things crashing on you when your child arrives into the world. It's like you've met your reason to live. We are all born for love, it is the principle of existence and its only end. There's something that just happens to you when you have a baby, and you look at their little eyes for the first time when you're holding them. Spend some time observing babies. They don't work; they poop in their pants, and they have no goals other than to expand, grow and explore this amazing world. Be like that baby you once were, in terms of being joyful. God’s interest in the human race is nowhere better evidenced than in obstetrics. Holding these babies in my arms, makes me realize the miracle my husband and I began. When babies look beyond you and giggle.. maybe they're seeing Angels. If one feels the need of something grand, something infinite, something that makes one feel aware of God, one need not go far to find it. I think that I see something deeper, more infinite, more eternal than the ocean, in the expression of the eyes of a little baby when it wakes in the morning and coos or laughs because it sees the sun shining on it's cradle. No matter what happens between us, during my childhood I will always love you unconditionally. You are my Guide, my Support, my Lifetime Anchor... For whatever becomes of me, depends upon our time together. From you I will learn what love is. I will learn to be... Confident or shy, Giving or selfish, Loving or unkind. I will also learn... what is right and wrong, who I should respect and whether I should respect and love myself. and they will mould me into the person I will become. Letter From Newborn (above) was written on the birth of my first grandchild Jessica in 1997, this was my first poem, it just 'poured out' after hearing of her birth. Back then I did not know of the Law of Attraction, or, of how true these words are, so I believe I was guided to write this. 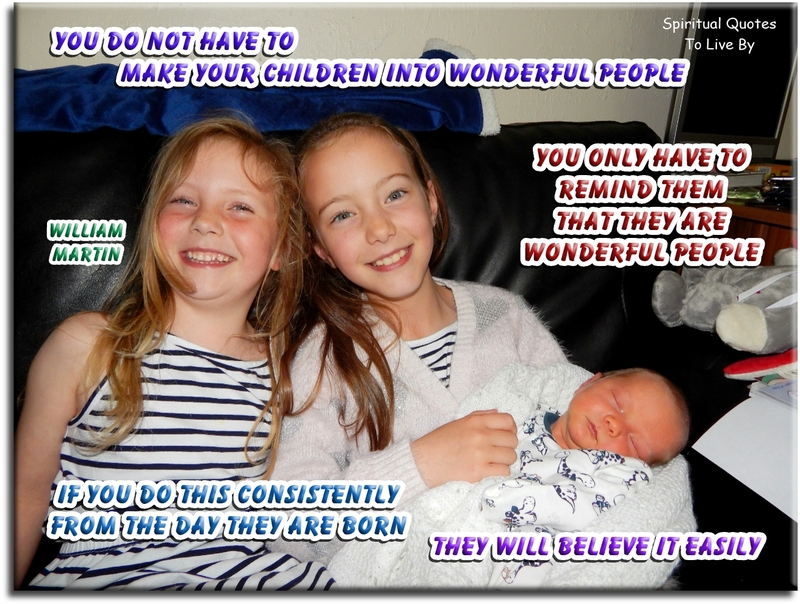 I was delighted Letter From Newborn was used by photographer Drew McWilliams on his site, especially as in his blog he combines two of the things I love - quotes and family photographs - to such a wonderful effect, he captures so much emotion in his pictures. Baby Vows was written after the birth of my granddaughter Lucy in 2002. Her parents were different religions, so I wanted to create wording for a Naming Ceremony. I promise to always love you. No matter what you do or say, my love for you will always be unconditional. I promise to nurture you, providing you with love, comfort and security to the best of my abilities. I promise to always protect you. Your safety and well-being will always be on my mind. I promise to do my best. I am only human and I will make mistakes, but I will always do the best that I can for you. I promise to always be there for you. Even later, as the years go by and we grow apart, know that you can always turn to me. I promise to teach you right from wrong. By my actions, you will learn. I promise to guide you. Throughout your life, I will act as your guide. Either, you will want to do the things that I do or say, or, you will not want to do them, because I do. I promise to be your anchor. When life gets you down, I will be there to hold you and support you. I promise to let you become independent. As the years pass, I will ease you out into the world. I promise not to use you as a pawn. If my relationship with your other parent changes, I will always do what is best for you and not bring my feelings into your relationship with them. I promise to seek help when I need it. We all need support sometimes, to cope with life's problems. I promise to let you find your own path to God. I will show you my way but you will be guided to your own path. I promise to teach you tolerance. We are all individuals and cannot always agree, but I will teach you, by my example, to be tolerant. I promise to teach you the things of real value. Love, Peace, Joy.. there are so many simple things in life to enjoy. I promise to teach you to cherish our planet. By example, you will learn to care for our environment. I understood once I held a baby in my arms, why some people have the need to keep having them. Suddenly she was here. And I was no longer pregnant. I was a mother. I never believed in miracles before. One of the most powerful handclasps is that of a new grand-baby around the finger of a grandfather. Before you were conceived, I wanted you. Before you were born, I loved you. Before you were here an hour, I would give my life for you. This is the miracle of life. It is strictly believed and understood by the Sioux that a child is the greatest gift from Wakan Tanka, in response to many devout prayers, sacrifices, and promises. Therefore the child is considered ‘sent from Wakan Tanka’ through some element, namely the element of human nature. I could still remember how having a two day old baby makes you feel faintly sorry for everyone else, stuck in their wan un-miraculous lives. There is nothing like a newborn baby to renew your spirit and to buttress your resolve to make the world a better place. Each of us enters the world because hope for the future preceded us. Whenever I held my newborn baby in my arms, I used to think that what I said and did to him could have an influence not only on him but on all whom he met, not only for a day or a month or a year, but for all eternity. 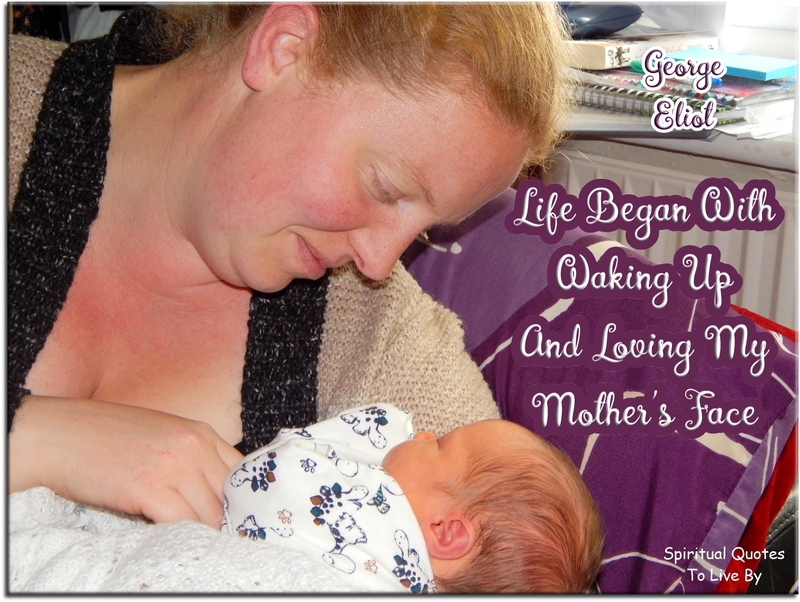 A very challenging and exciting thought for a mother. Just by staring at her baby, the reward centres of a mother's brain will light up - scientists have found in several studies. The act of simply caring for one's baby, forges new neural pathways - undiscovered rooms in the parental brain. 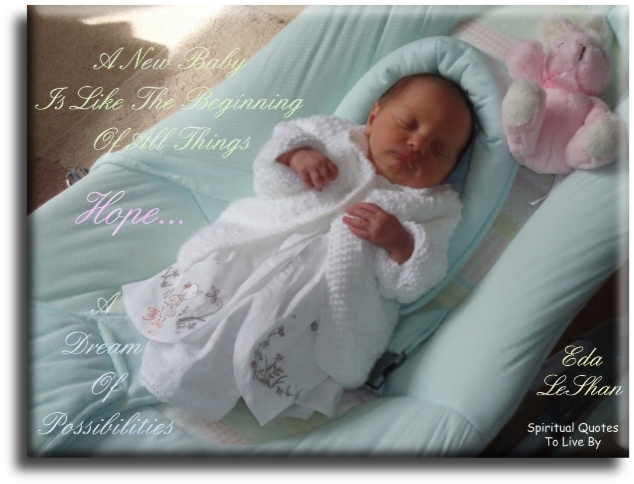 A new baby is like the beginning of all things... hope, a dream of possibilities. When a child is born... so are grandmothers. Having a staring contest with a newborn is one of the weirdest things you'll do. And it is highly recommended. 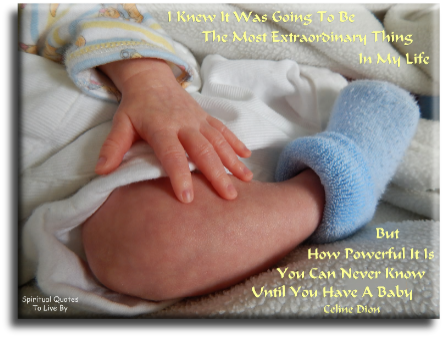 It's extraordinary to look into a baby's face and see a piece of your flesh and your spirit. It makes you realise, you are a part of the human race. Getting a burp out of your little thing is probably the greatest satisfaction I've come across. It's truly one of life's most satisfying moments. 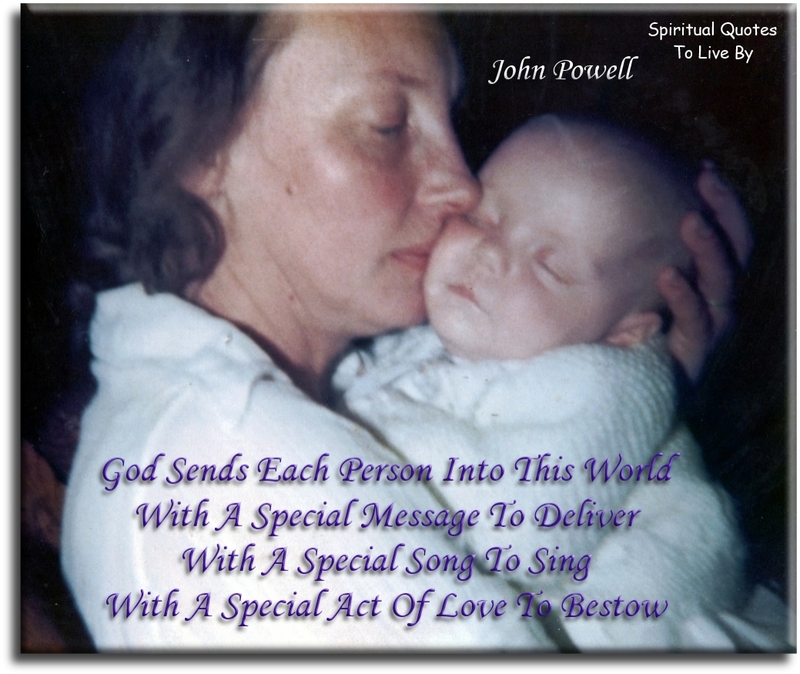 God sends each person into this world with a special message to deliver, with a special song to sing, with a special act of love to bestow. You have wings...Learn to use them and fly. 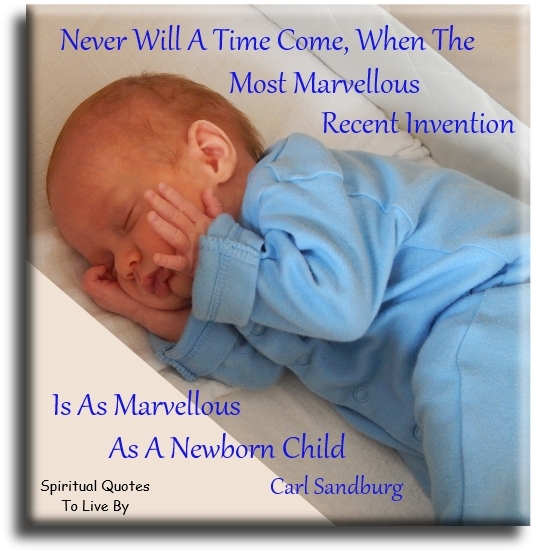 Never will a time come when the most marvellous recent invention is as marvellous as a newborn child. Every child, begins the world again. We are all born carrying a promise - a promise to make the world better - and there's a yearning to make good on that promise that none of us can suppress forever.